Ouvvaiyaar is a legendary— even mythical — poet in Tamil literature. 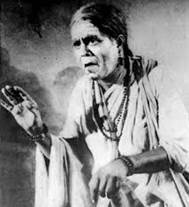 With the name meaning in Tamil “The respectable Old Lady,” one can imagine the exalted place her name occupies among Tamils, whether scholars or commoners. Literary historians believe that more than one person went by the name, one in the Sangam literary time (a few centuries before the Current Era), and the other, around 10th century CE. They assert this based on the styles and the vocabulary in the poems attributed to her. All that people need are a morsel of food and six-yards of cloth. And their life is as fragile as a clay pot. People live till death in millions of vacillations and worries. [But] making a living with one’s own sweat is unmatched and laudable. This entry was posted on April 7, 2019, 6:04 pm and is filed under Current Issue. You can follow any responses to this entry through RSS 2.0. You can skip to the end and leave a response. Pinging is currently not allowed.